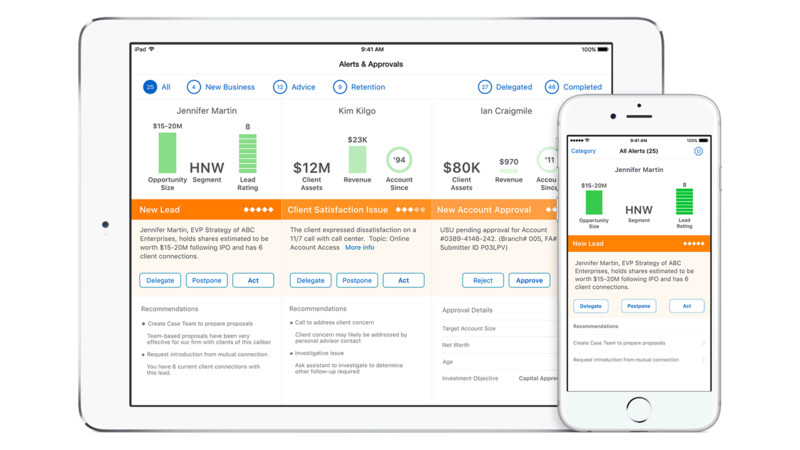 IBM MobileFirst for iOS Advisor Alert uses analytics to help wealth advisors prioritize critical client-related tasks. IBM MobileFirst for iOS Advisor Alert helps wealth advisors prioritize client-related tasks while on-the-go, to make well-informed, timely decisions. Backed by customized analytics, the app tells the advisor what’s most important using a personalized dashboard that displays recommended next steps, portfolio-impacting alerts, and provides a communications platform to quickly delegate tasks to teams back in the office. Gain next best action analytics and stay informed with the right information to prioritize client tasks, on the road or at a client site. Provides real-time and actionable alerts to make informed decisions. Delivers alerts in order of importance so wealth advisors can have the right client information when it matters most.